The model has been designed for the British Museum in London. The model shows a scene from the ancient Egyptian Book of the Dead. 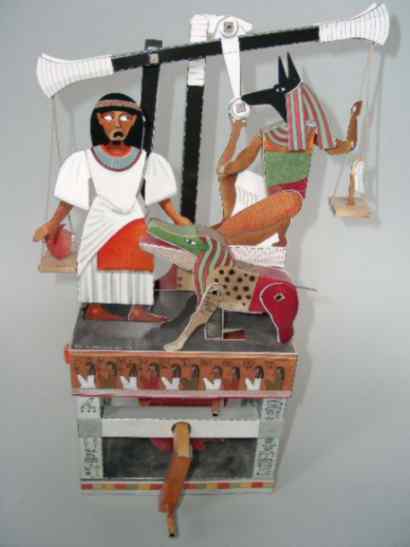 The heart of the deceased (on the left, dressed in white) is weighed against the feather of truth by the god of the death Anubis (kneeling, with the head of a jackal). If the heart weighs more than the feather the dead person had been a bad. The monster "Ammut" snaps at him/her and prevents him/her from everlasting life.ou will get detailed informations about the model in my lecture on the 14. International Cardboard Modelers Convention on April 28th 2002 in Bremerhaven/Germany.